Our Abpromise guarantee covers the use of ab7403 in the following tested applications. Horseradish peroxidase is conjugated to the streptavidin tetramer at ~1:1 molar ratio. ab7403 is stable for several weeks at 4°C as an undiluted liquid. Dilute only prior to immediate use. This product has been assayed against 1.0 µg of Biotinylated IgG in a standard capture ELISA using a peroxidase substrate as ABTS ab142041 as a substrate for 30 minutes at room temperature. A working dilution of 1:15,000 to 1:60,000 of the reconstitution concentration is suggested for this product. Optimal titers for other applications should be determined by the researcher. Shipped at 4°C. Upon delivery aliquot. Store at -20°C long term. Avoid freeze / thaw cycle. IHC image of Histone H1 staining in a section of formalin-fixed paraffin-embedded [human normal colon]*. The section was pre-treated using pressure cooker heat mediated antigen retrieval with sodium citrate buffer (pH6) for 30mins. The section was then incubated with ab11080, 1/1000 dilution, for 15 mins at room temperature. 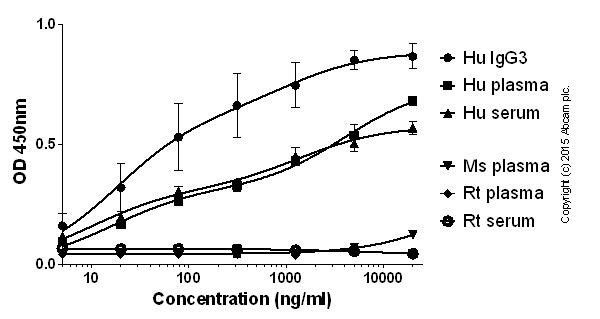 A goat anti-mouse biotinylated secondary antibody (ab6788, 1/1000 dilution), was used to detect the primary, and visualized using an HRP conjugated ABC system. Streptavidin HRP was used, ab7403 at a 1/10000 dilution. DAB was used as the chromogen (ab103723), diluted 1/100 and incubated for 10min at room temperature. The section was then counterstained with haematoxylin and mounted with DPX. The inset negative control image is taken from an identical assay without primary antibody. The wells were coated with ab200699 at 1µg/ml at 50µl/well overnight at 4°C, followed by a 5% BSA blocking step for 2h RT. Human IgG3 (ab138703) was then added starting at 20 µg/ml and plasma/serum at 1:500 and gradually diluted 1:4, 50µl/well for 2h. Ab201248 was then added at 1:10,000 dilution, 50µl/well for 2h. A HRP-streptavidin (ab7403) was used at 1:10,000 dilution for 1h. Publishing research using ab7403? Please let us know so that we can cite the reference in this datasheet. We performed modified biotin switch assay where the biotinylated sulfhydrated proteins were incubated with ab7403 - Streptavidin (HRP) for 1h at room temperature (1:100) and then immunoblotted for detection of sulfhydrated protein status. A standard sandwich ELISA experiment worked very well by use of ab7403 with 1/30,000 dilution. Detailed protocol was described below. 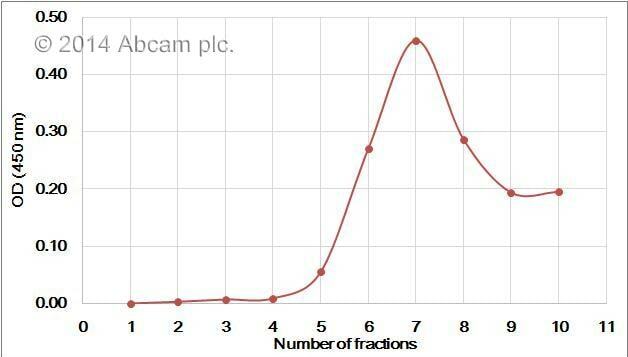 *5 uL of human serum was separated with size exclusion chromatography into 10 fractions.